About 7 minutes and 51 seconds reading time for this 1.9K word page. Did the State of Louisiana OCD-DRU forget to inform homeowners and grant recipients the correct amount of NFIP Flood insurance to carry to cover Program Costs? Why did a 30 day notice go out just 30 days after the unannounced policy change of 10-5-2018? Part III of IV based on: "Flood Insurance Requirements"
The Homeowners Program Material for Flood Insurance has not been updated since May 16, 2018 and does not reflect changes made in the Homeowners Program Policy Manual version 4.0 and 4.1 published Oct. 5 and Oct. 12 of 2018. This flyer was included in the postal mail notices and sent as an attachment by email. The State of Louisiana identifies the group of homeowners required to carry flood insurance as homeowners living in Special Flood Hazard Areas or SFHA for short. FEMA Resource: Special Flood Hazard Area "The SFHA is the area where the National Flood Insurance Program's (NFIP's) floodplain management regulations must be enforced and the area where the mandatory purchase of flood insurance applies. The SFHA includes Zones A, AO, AH, A1-30, AE, A99, AR, AR/A1-30, AR/AE, AR/AO, AR/AH, AR/A, VO, V1-30, VE, and V."
This flyer references "Project Costs" as "The full insurable value of the structure as defined by Restore as the total project cost for your home." 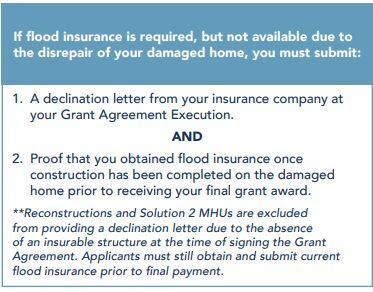 The Restore Program requirement for flood insurance should offered an updated version of the "Flood Insurance Requirement" flyer linked from the eGrants portal at the time the homeowner accepted the "Grant Agreement" (Acceptance). A physical review and FEMA NFIP report of the amount of insurance coverage at the time of closing on the grant award would have only left human error as the problem of allowing grants to be awarded without the proper amount of NFIP coverage. The Restore Program was accepted FEMA Group flood insurance for hundreds of homeowners up and to Oct. 5, 2018. After the homeowners policy update on Oct. 5, 2018 it appears the state is only allowing 30 days for disaster victims that do not have the proper amount of coverage to increase coverage or be ineligible for grants from HUD and must return any grant award they may have received. It is also not clear how the state will manage Solution 3 households that sold their homes after recieving their grant awards. Will the state investigate the new owners to see if the grant recipient informed the new owner of the federal requirement to continue with NFIP insurance for the life of the structure? In an effort to correct this training or management error by the state OCD-DRU and it's contracted management companies the "Program" modified the Homeowners Policy Manual Oct. 5, 2018 to include the line "The full insurable value of the structure will be based upon the Program's final total project cost for the applicant." This line was not previously noted in the Homeowners Manual and was not clearly shown in Homeowners Material such as this Homeowners Flood Insurance Requirements flyer based on May 16, 2018 version 3.1 Homeowners Policy. The state of Louisiana OCD-DRU once again has not communicated changes to homeowners as HUD policy requires. There were over 70 policy changes that were not announced to homeowners between versions 3.1 and 4.1 of the homeowners policy manual. The insurance policy was one of them. Changes to Grant award numbers do happen, having vague guidance to what your actual insurance requirements are places homeowners at risk of being "deemed ineligible" as stated in the homeowners letter sent out the first week of Nov. 2018. Homeowners that are Solution 2 repairs may have found an unforeseen issue and need to revisit their grant award amount and increase the estimated cost of repairs. This increase will have to be covered by a Flood Insurance policy. Homeowners that are in Solution 2 reconstruction will need to know their full award amount to be able to budget for the final payment day which is when reconstruction homeowners are required to provide flood insurance. The cap to the homeowners responsibility is $250,000 as of today (11-29-2018). Homeowners are not made aware of a 30 day hold period and sometimes longer based on your insurance provider and the season. Will the grant award be in jeopardy if a delay of 30 days or more is placed on their new policy? "Projects Costs" will need insurance policies equal to or greater than that of the total Restore Louisiana Homeowners Program "Project Costs" which is your final grant award. The issue with Section 3 is that the information provided here does not make it clear to what the total costs to the program actually are. From HUD: "The amount of coverage must at least equal the total project cost or the maximum coverage limit of the National Flood Insurance Program, whichever is less." The total "Project Costs" is collected from the first part of the homeowners grant award. It is very clear when you read HUD policy, and our updated Homeowners unannounced policy version 4.0 on Oct. 5, 2018 that the homeowners of any grant from HUD via the grantee state of Louisiana OCD-DRU will have to carry at least as a minimum amount of insurance that totals not less than the "Project Costs" for whichever solution (1,2,3) the homeowner selected. The Project Costs are reflected in the Repair Information section of each homeowners grant award offer. If the homeowner selected Solution 2 Reconstruction and the total "Project Cost" (grant award) is $295,000 the minimum amount of NFIP Flood Insurance required would be $250,000 because that is the maximum amount the National Flood Insurance Program (NFIP) will offer. This needs to be clearly shown in all homeowner policy manuals and informational materials. We will also need to understand how the state is going to fund the "Lifetime" of recapture and if HUD has policy and guidance regarding the recapturing of grant awards a decade from now. Question for Restore LA: When HUD uses the words "Program Costs", does HUD appears to indicate HUD Grants and not included FEMA, NFIP, federal assistance which would be listed in the Duplication of Benefits column of the Grant Award Letter. This would lower the actual "Program Costs" which then would reduce the amount of insurance coverage by the homeowner. Can we request clarification on what the actual "Program Costs" are in relationship to an actual grant award that includes other federal assistance in the calculation to determine the final HUD CDBG-DR grant award amount? Guidance from our CPD people in NOLA and from Washington D.C. if needed would be a great start. "Homeowners being served by the program who do not provide proof of flood insurance in the amount required as noted above will be ineligible to receive grant funding and all of your Restore funds may be subject to recapture, including those disbursed in reimbursement. Failure to maintain insurance may result in applicants being ineligible for future disaster relief. 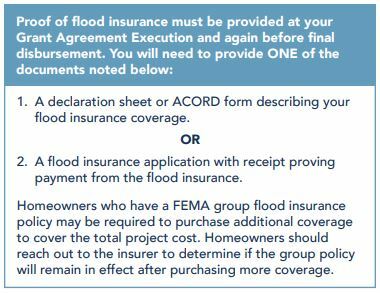 Homeowners who received federal disaster assistance for a flood damaged home must purchase and maintain flood insurance coverage on the flood-damaged property for as long as the flooded home exists. If the homeowner sells the home after receiving federal disaster assistance, they must inform the new owner of the requirement to maintain flood insurance coverage. In most cases, an existing flood insurance policy transfers to a new owner with no lapse in coverage." RLHP should know by now that once a homeowner purchases private NFIP insurance the FEMA group insurance is dropped which appears to be standard practice by FEMA. No additional coverage can be purchase, it has to be a new complete policy from a NFIP policy insurer. This should have been research better to be less confusing and frustrating to homeowners. This often applies to homeowners with substantially damaged homes. Referencing Section 3 which shows how the program determines the homeowners total Project Costs do not take into account any duplication of benefits calculations that actually reduce the HUD Project Costs. In Section 4 above identifies that recapture is associated with Restore funds which gives the impression that the Project Costs are only the costs or amounts that Restore has paid out in the form of grants. HUD offers little clarity to this question from their website because they are using the words "Program Costs" without bringing into account other variables such as Flood Insurance (NFIP), FEMA Grants, that change the actual costs to the Program and effectively lower the payout of grant awards from Restore Louisiana for our declared disasters DR-4263 and DR-4277. Discussion and Clarification Request from Director Patrick Forbes Office of Community Development state of Louisiana. "For grants and other non-loan forms of financial assistance, flood insurance coverage must be continued for the life of the building irrespective of the transfer of ownership. The amount of coverage must at least equal the total project cost or the maximum coverage limit of the National Flood Insurance Program, whichever is less. " Questions for LA OCD-DRU (Restore): Where do homeowners find a copy of this notice or an example of a notice and how it is to be written so not to place the selling homeowner at risk of being liable for future disaster assistance funds?